Speaking in the summer of 2016, Ozzie Canseco explained what backed his approach to young hitters, according to The Amarillo Globe-News. The hitting coach for the Sioux Falls Canaries reached back to his playing days. "The fact that I got a lot of experience in minor league baseball helps," Canseco told The Globe-News. "I know how to develop young hitters and their minds." By 2016, Canseco had plenty of experience in the minors and in independent ball, more than three decades of it. He also had some experience in the majors, all of 24 games over three seasons. He also had the experience of being the twin brother of one of the most well-known baseball players of the late-1980s and 1990s, Jose Canseco. Canseco's career in baseball began in 1983, taken by the Yankees in the second round of the 1989 draft out of Miami-Dade College. Canseco started his pro career with the Yankees as a pitcher at single-A Greensboro. He went 3-6 over 27 outings, 13 starts, with a 5.05 ERA. He continued as a pitcher through 1985 without making it higher than single-A. Released by the Yankees, Canseco then signed with the team of his brother, the Athletics. He played that year and the next at single-A Madison, in the outfield. He first made AA Huntsville in 1988. In March 1989, Canseco spoke to The Associated Press about his relationship with his brother and his brother's possible effect on his own career. "We've never been rivals," Ozzie Canseco told The AP. "I'm very happy for him. We try to help each other. Maybe because of the way they saw him develop, the organization might stick with me a little longer." 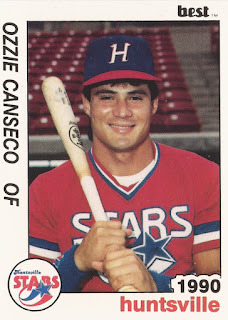 Canseco stayed at Huntsville through 1990. In July 1990, he made the brief jump to Oakland, getting into nine games. He picked up two hits in 19 at bats. Canseco went to Japan in 1991, playing in the minors there. He also worked to learn to hit off-speed pitches. He returned stateside with the Cardinals in 1992, getting nine games in St. Louis. He hit .276. In September 1992, Canseco spoke to The AP of separating himself from his brother and making his own way. "I don't know if I can be just like him, because that's very difficult," Canseco told The AP. "I'd just like to come out here and play ball every day and hopefully stay as long as I can." He then returned to the Cardinals for 1993, getting six more games, marking the extent of his major league career. Canseco played one more season in the minors at AAA with the Brewers in 1994. He then returned four years later in independent ball with Duluth-Superior and Fargo-Moorhead. Playing with the independent Newark Bears in 2000, Canseco hit 48 home runs, by far a career high. Canseco later became a coach in independent ball, continuing with Sioux City in 2016.